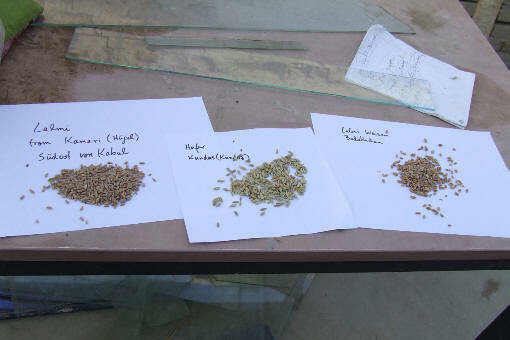 The seeds on the left are wheat seeds from the Kameri district in South East Kabul grown by a technique called Lalmi, meaning they grow easily and naturally with only rain water. In the centre are oats grown by lalmi in the province of Kunduz. On the right is lalmi grown wheat from the province of Badakhshan. Due to its red colour, it is given the name sorcha gandom, literally meaning red wheat.